Do you suffer from acute hip pain? It may be a condition known as bursitis. Bursitis of the hip is painful swelling and inflammation of the fluid-filled sacs, called bursae, that facilitate smooth movement of tendons, ligaments, and muscles over joints. Bursitis of the hip causes stiffness, pain, and tenderness in and around the hip joint. Bursitis is the most common cause of hip pain. When the bursae in this joint become inflamed due to strenuous exercise, a strain injury, or soft-tissue trauma, they can cause pain and stiffness associated with bursitis. Trochanteric bursitis is inflammation of the bursa on the outer side of the hip joint. It can cause pain and tenderness on the outer side of the hip, especially after excessive walking, exercise, or stair climbing. Trochanteric bursitis can disturb the sleep of people who lie on the affected side. Ischial bursitis is inflammation of the bursa in the upper buttock region. It causes dull pain in this area, especially during and after climbing stairs as well as after sitting for long periods of time. Both types of bursitis of the hip can be acute — flaring up for hours or days — or chronic, which can last for a few days or several weeks. Don’t let the pain and stiffness of bursitis of the hip slow you down! Most forms of bursitis can be managed with simple changes in your routine and medication. The medical professionals at FastMed Urgent Care can diagnose your hip pain and offer the most appropriate treatments to get you feeling better fast. We welcome walk-in patients and aim to get you in and out of the office in less than an hour. We offer extended weekday hours and are open seven days a week, all year long. No wonder our patients love us! 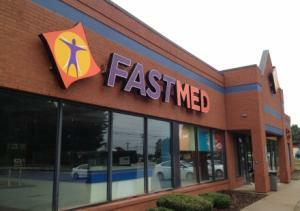 Want to find out more about how FastMed Urgent Care can help relieve your bursitis of the hip? Check out our FAQs page.